Cunard Line’s Queen Victoria will be five years old in December 2012. She is still a young ship but old enough now to have formed her own identity. Accordingly, I sat down with Hotel Manager David Hamilton and Entertainment Director Paul O’Loughlin to get their thoughts on the cruise experience on today’s Queen Victoria. 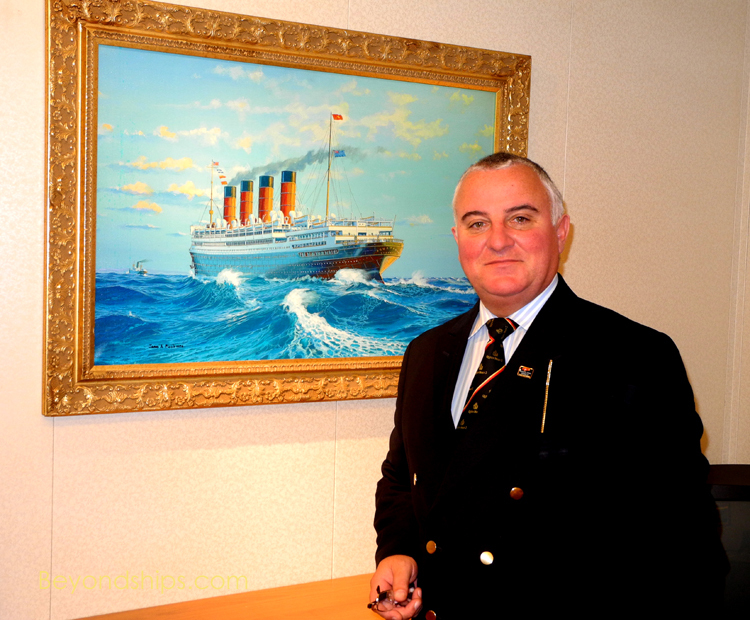 Mr. Hamilton has been with Cunard for 35 years and has served on ships such as Caronia, Cunard Princess, Cunard Countess and the legendary Queen Elizabeth 2. He has served on Queen Victoria for much of her career and now alternates between Queen Victoria and the new Queen Elizabeth. His assessment of where Queen Victoria is now? Hamilton pointed out some of the features that distinguish Cunard ships from other ships including: large ballrooms, extensive libraries, good quality furnishings and fittings and enough space to absorb the number of people the ship is carrying. However, it is not any one feature that makes Cunard different. Perhaps because Cunard is such a traditional line, some people have the idea that the Cunard ships are divided by classes as in the days of the Titanic. Mr. Hamilton explained that perception is just not accurate. “The days when there was segregation of the ship itself probably stopped around 1980. [Today,] everybody has the run of the whole ship. To some extent, everyone traveling on a ship has privileges. It is not a class thing. Yes, there are people onboard who have paid more and are receiving more - - the Grill restaurants, the one bar and the deck space.” In other words, just as guests who travel in the suites on other ships have privileges that other guests do not, the guests traveling in the suites on Cunard ships have an additional set of privileges beyond those of people traveling in an inside stateroom have for example. Cunard currently has three ships. Queen Victoria and Queen Elizabeth are very similar in design and do similar itineraries, cruising for much of the year out of Southampton, England. Queen Mary 2 is a unique design and is a much larger ship. She spends most of her time doing transatlantic crossings between New York and Southampton. “Also, Queen Victoria’s [itineraries are] more port intensive whereas Queen Mary 2 is an ocean liner, built for the sea, so she spends a lot more time at sea.” This too affects the programming as the focus on Queen Mary 2 is on what is happening on the ship whereas on Queen Victoria the experience is divided between life onboard and in the ports. In sum, the cruise experience on Queen Victoria is very much in the Cunard ocean liner tradition - - formal, sophisticated and for the discerning traveler. At the same time, she differs from fleetmate Queen Mary 2 in that she is less international but more intimate. However, as Mr. Hamilton noted, what really defines her personality is the happy spirit of her crew.